With smartphones and tablets accounting for an ever-increasing share of consumers’ media time, it’s a good bet that mobile visitors now make up an important part of your web traffic. However, simply knowing that these visitors are important isn’t enough. To make well-informed decisions about everything from site structure to design elements, you need to know specifics: How many of your website visitors are mobile visitors? Which devices are they using? What sort of experience are they having on your site? Trying to figure all this out while also monitoring your usual website data can sometimes feel daunting. Luckily, there are a few key indicators that can give you a good overview of your mobile visitors and how to serve them better. Above all else, you probably want to know what percentage of your visitors are arriving via mobile devices. This used to be a bit difficult to figure out, but in the past few years the major analytics suites have made it increasingly easy to see. In Google Analytics, for example, you can find the breakdown by simply going to Audience > Mobile > Overview. A key thing to pay attention to here is the tablet/mobile breakdown. Too often people tend to lump phones and tablets together, but visitors from each type exhibit extremely different behaviors on websites–including time spent, media consumption, and how they shop. The next level of information that’s useful to know is mobile device type. With the rise of responsive design, this has become less important but it’s still worth checking every so often. In particular, knowing exactly which operating systems, tablet types, and phone types your visitors use can help when making all sorts of technology investments. Again, this data is pretty simple to access. 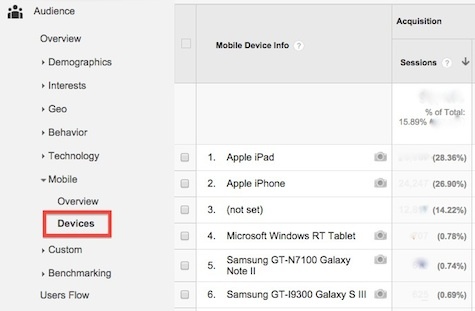 To find it in Google Analytics, simply head over to Audience > Mobile > Devices. The next three important metrics involve a few extra clicks, but are still pretty easy to access. 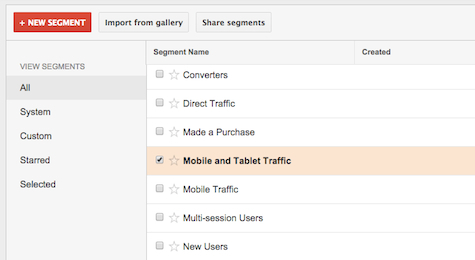 To see them in Google Analytics, you’ll first need to click on the “Segment” box from almost any page in the tool, then select either “Mobile and Tablet Traffic” or just “Mobile Traffic” from the list, depending on what you want (in this case “Mobile Traffic” means only smartphones). Now you’re ready to see the metrics. In Google Analytics, simply head to Acquisition > Overview. If you’ve selected Mobile Traffic as a segment you’ll now see Acquisition, Behavior, and Conversions broken out by mobile visitors. Why does this matter? Because this allows you to see which of your marketing efforts are succeeding in attracting mobile visitors (Acquisition), how these visitors are spending their time (Behavior), and whether they’re taking action (Conversions). Finally, one more metric to keep track of: site speed. Having a fast-loading website may be important for desktop visitors, but it’s absolutely essential for mobile visitors—since many have bandwidth constraints or less time to wait. To see how quickly (or slowly) your site is loading for mobile visitors, head to Behavior -> Site Speed in Google Analytics (make sure to select “Mobile Traffic” or “Mobile and Tablet Traffic” as a segment). One thing to note is that these speed numbers are based only on a sample, so they’re by no means exact. They can also be thrown off by certain factors. Still, they should give you a sense of whether you need to pay more attention to your site speed for mobile visitors. Ultimately, these metrics won’t answer all your questions about your mobile visitors. However, they will serve as a good starting point to understand how many you have, and how you can serve them better. 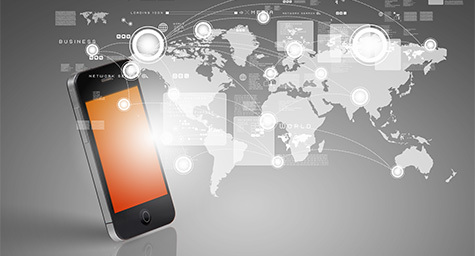 Monitor how mobile impacts the traffic on your brand’s website. Contact MDG Advertising today at 561-338-7797 or visit mdgadvertising.com. MDG Advertising is a full-service advertising agency and one of Florida’s top branding firms. With offices in Boca Raton and New York City, MDG’s core capabilities include branding, logo design, print advertising, digital marketing, mobile marketing, email marketing, media planning and buying, TV and radio, outdoor advertising, newspaper, video marketing, website design and development, content marketing, social media marketing, and SEO. To discover the latest trends in advertising and branding, contact MDG Advertising today at 561-338-7797.